Brad Frost grew up amidst a family that has a passion for the sport of hunting. Following in the footsteps of both his father and grandfather, Brad naturally became a hunting enthusiast. As his devotion to hunting increased, Brad spent many years traveling across the U.S. to hunt various species of game. With his love of travel and adventure Brad began to explore new territories by traveling to Africa and Canada to pursue his hunting dreams. 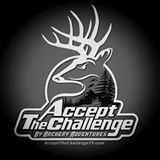 In 2004 Brad and his good friend Scott Carroll decided to to create “Accept The Challenge” TV so they could document their hunts and share them with their friends and family. Scott Carroll: Growing up camping and fishing most of the spring and summer months with his family, Scott’s love for the outdoors started at a very young age. His passion for the sport increased through squirrel hunting trips with his Granddad, Dad and younger brother. At the age of 12, Scott’s Dad watched as Scott took his first deer and his passion soon became an obsession. Scott attended Valdosta State College in Valdosta, Georgia and majored in Telecommunications; therefore, it was only natural for him to carry his camera while hunting. Realizing the challenges of hunting and filming at the same time, he became more determined to capture his hunts on film in order to share them with family and friends. He hoped the videos would inspire them to want to experience these adventures and enjoy the thrill of the hunt. To add further to the difficulties of hunting and filming, Scott chooses to do most of his hunting with stick and string. He invites the challenge, as it allows him to be at such close range with the animal. After many years of deer and turkey hunting, Scott began to travel to locations throughout the U.S. to hunt, as well as participating in several African safaris and hunts in Canada. After capturing the harvesting of many big game animals on video Scott decided to embark on a new adventure. Scott and his long-time friend and hunting partner, Brad Frost, decided to create Archery Adventures to help promote hunting and help others to realize their hunting dreams. It is their hope that through “Accept The Challenge” TV they can share their exotic hunts and educate others on the ultimate hunting experience.